The Royal Oak Pub is one of those places that I don't think about too much - it's not so much a destination spot for me as a regular place to grab a beer on the way to someplace else. I think this is more due to it's location than anything else - it's the perfect spot to hit leaving work and needing a place to hole-up to wait out traffic. Royal Oak is located across from the MARTA parking garage on the corner of Perimeter Center West (turns into Abernathy a couple of blocks West) and Mt Vernon - it's really centrally located and less than a half a mile away from where I work (behind Perimeter Mall). Yes there are many other places to fetch-a-drink around there, but this one provides a nice pub ambiance that I feel the most comfortable in. 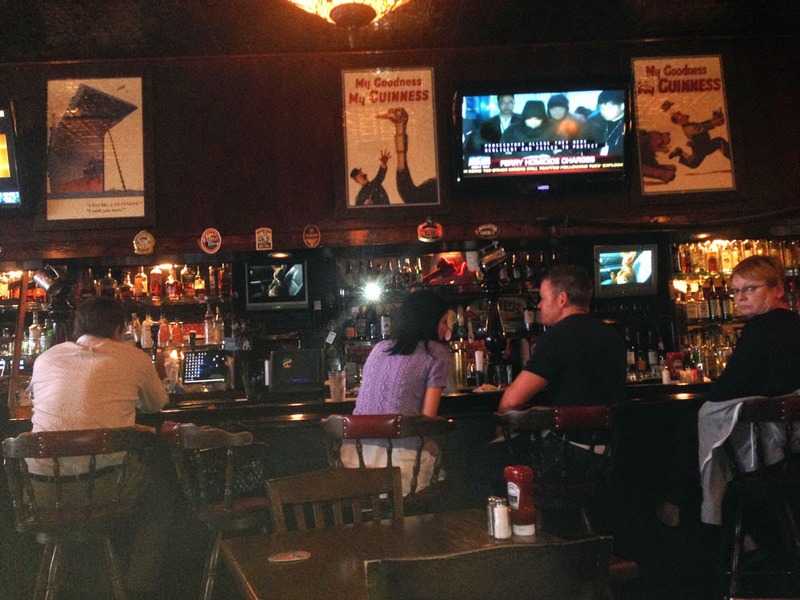 A few notes about Irish pubs - they need to be dark-and-woody, with an old-world feel. I expect to see old beer signs and wood paneling on the walls, a big long wooden bar with brass rails, wooden stools and chairs and many tap handles. The food needs to have an assortment of British pub food - basically if there isn't at least an order of fish and chips to be hand on the menu then I'm probably not coming back. That isn't to say that some of the "pubs" I've been in are very authentic - case in point, the fish and chips on many "Irish" pub menus is made from tilapia - frankly I probably won't order them if they're tilapia. The other thing that I look for in a pub is the feel of a neighborhood, featuring many locals and familiar faces. 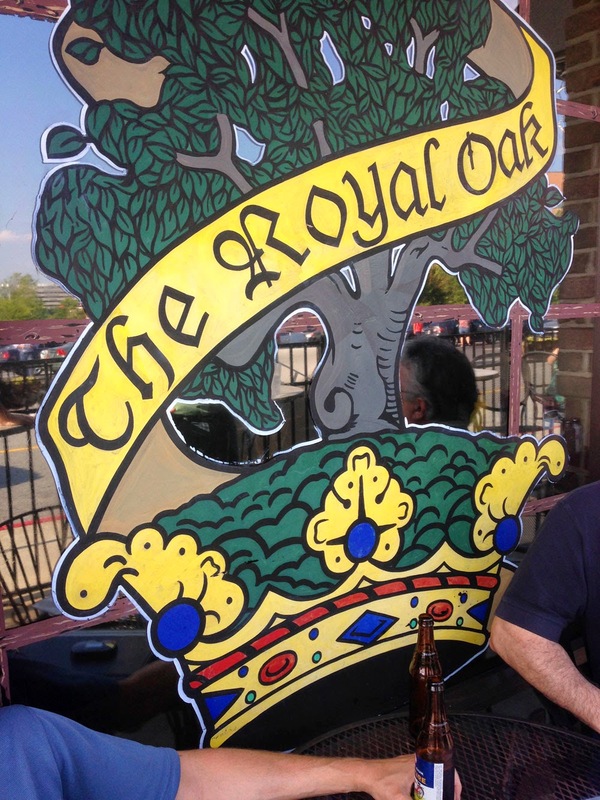 Over the years the Royal Oak hasn't failed to provide that to me - there are new faces, but many of the folks who frequent this location I recognize going back years. Facing the Royal Oak bar from one of the booths along the East side. This place isn't massive - a bit on the smaller size and it really becomes noticeable when you're in a large party or are seated in the single row of tables between the bar and the booths lining the East side (the bar lines the West side). Most nights it's this coziness that I like the most - after a hectic day of work who wants to bump elbows in a crowded bar? I've already mentioned that the pub is great as an intermediate point - we love coming here for a pint or three before attending a feature at the Regal Perimeter Pointe, nearly next door (there's a Starbucks and a smoothie place in between, but less than a 5 minute walk). Royal Oak also has a tiny area for outside seating (3-4 smallish tables) where you can people watch as the sun goes down - these tables get filled quickly though so best if you get an early start. On to the food, as I've already mentioned the fish-n-chips (note that I don't in general have anything against tilapia, the fish-n-chips thing is more of a pet peeve of mine), but I do want them to be both cod and not the cod tail piece and the Royal Oak does deliver - I usually get two pieces. My favorite thing on the menu is the Ahi Tuna Tacos - these are frankly delicious - rare seared ahi tuna bedded on "Korean" slaw, in a flour tortilla with a wasabi drizzle. Savory, spicy, and blasts your sinuses simultaneously - what more can you ask for? It's also a bit lighter than some of the other fried-pub food. For more Irish pub-ish food you can also have the Bangers and Mash or the Shepherd's Pie - I'm glad that the Royal Oak (and actually the entire chain - more on this below) is at least trying. There are also a handful of traditional farm plates that are great for sharing (Highland Scotch Eggs & Sausage Rolls, Ploughman's plate, Cornish Pasties, Triple Dip and my favorite - the Market Meat and Cheese - seems it's becoming more common to serve appetizers like these and it certainly adds to the communal feel of the place. 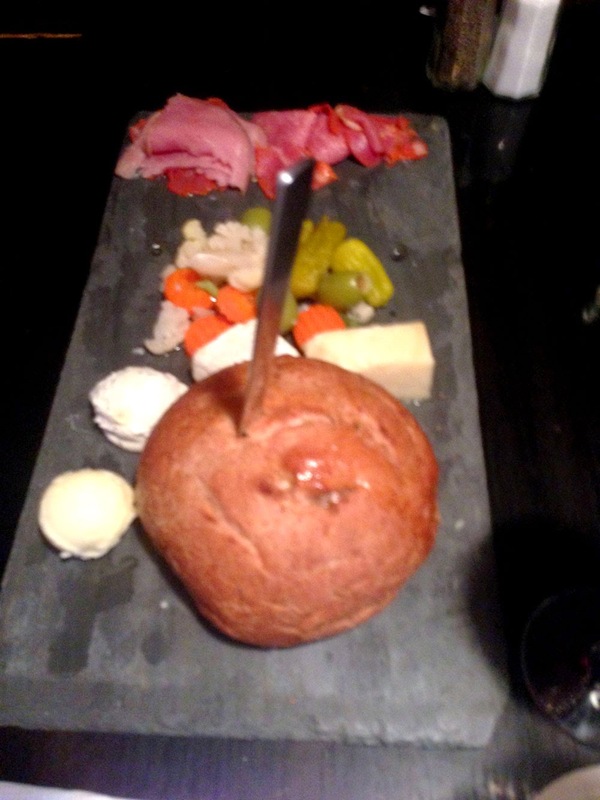 Most recently the Pub has offered up some "tapas" style plates so you can enjoy small apps as you drink your pints. From what I recall the last time I was there (couple of days ago but the memory is a bit fuzzy), I think you get either one of these plates for free or two-for-one during happy hour. They also have some beer specials. Of the rest, over the years I've had most of the appetizers, several variations of the burgers and sandwiches, a handful of the salads and a couple of the main courses. 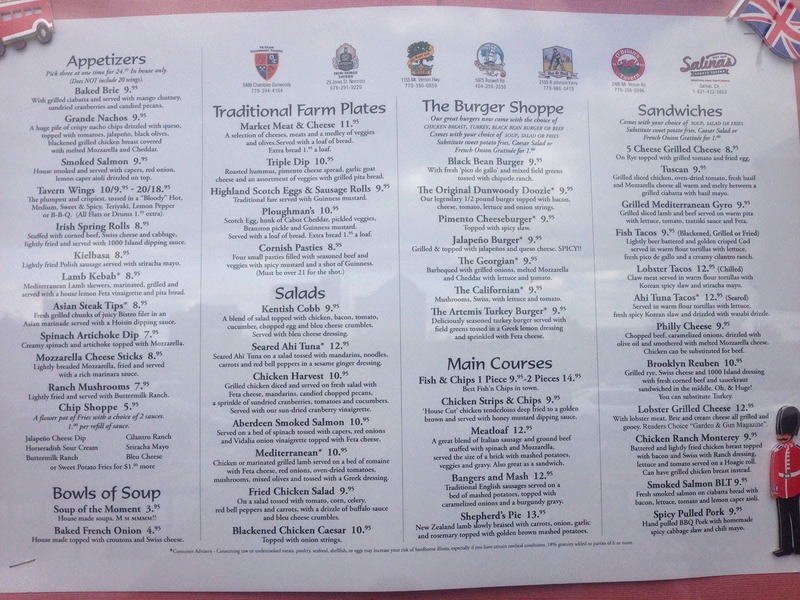 I think everything here is palatable, well presented, fresh and reasonably priced (would someone please put their Rueben's on Rye bread though?). I do wish there were a few more options on the beer menu, especially for craft brews and they do seem to be edging more into that directions. They do have my favorite standby, Sweetwater 420 on draft, as well as Blue Moon and what you would expect in an Irish pub: Guiness, Harp, Bass and the usual US mass-market beers. Recently they've added bottled Fat Tire and just a couple of days ago I enjoyed a Terrapin Hoppsicutioner on draft as a surprise. You know it's all about the Beer for me, right? 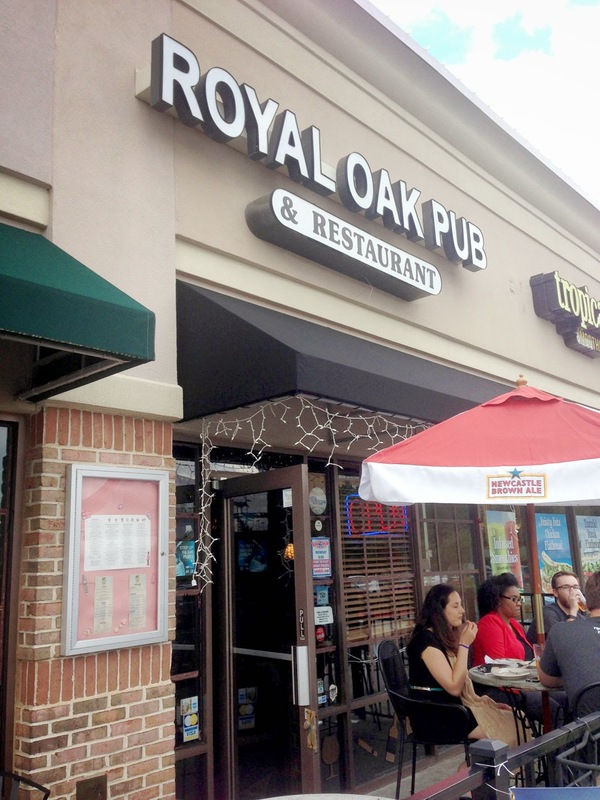 Royal Oak is part of a small chain of pubs in the area including: Dunwoody Tavern, the Iron Horse Tavern, the Ship and Anchor, the Bat and Ball, and O'Brian's. Somehow I've managed to visit all except the last of these - my favorites are the Royal Oak and the Iron Horse (the former is close to work and the latter is close to my home). 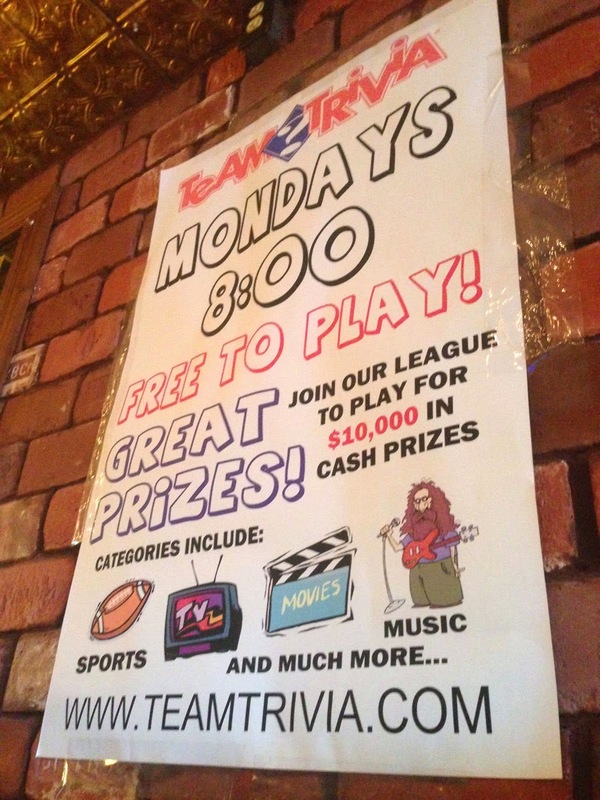 They also are part of the Team Trivia group (Monday nights at Royal Oak) which can be amusing or annoying, depending on your personality.